The art scene in Santa Barbara boasts a wide array of media and genres from creators ranging from talented enthusiasts to world-class professionals. But more importantly, this community is planting seeds in schools across town and carefully cultivating the next generation of artists. Spring has sprung, and high school theater practitioners are blooming under the guidance of educators such as Dana Caldwell, Otto Layman, Shannon Saleh, and Clark Sayre. Don’t sleep on the area’s high school spring musicals: These productions feature professional-level design in beautiful venues, giving young performers the experience of treading the boards in a working theater. These teens are talented and dedicated, and many go on to continue their work in art after graduation. This spring’s musicals include classics and new favorites, and the educators helming the ships are using these pieces to start conversations about social issues within the context of theatrical presentation. 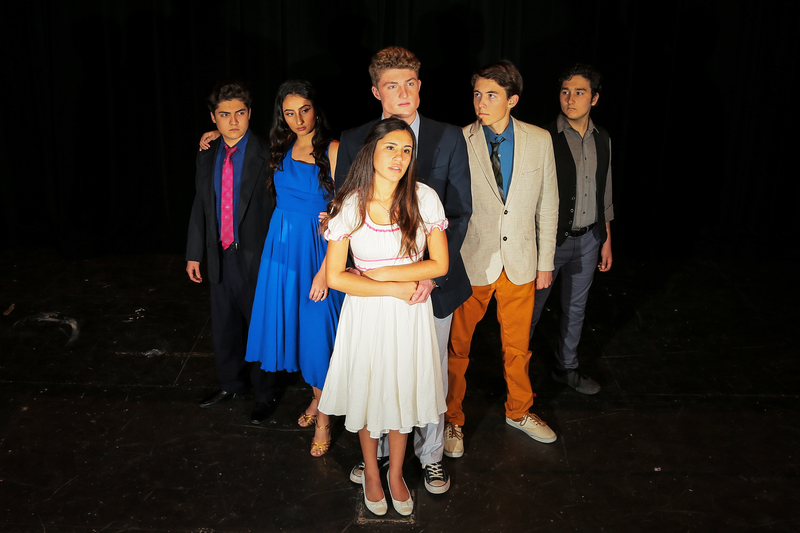 Dos Pueblos High School presents the enduring favorite West Side Story, a Romeo and Juliet tale in mid-century New York. Maria is a young Puerto Rican woman who falls in love with Tony, who’s white. Beyond young love, the story highlights racial prejudice and gang violence — social ills we still contend with today. Director Clark Sayre chose this piece for its “amazing potency and relevance for our world today, dealing with our nation’s hot-button issues, like immigration, #MeToo, Black Lives Matter, and the March for Our Lives. West Side Story doesn’t tell us how we need to feel about these issues, it presents them in a way that we can draw our own conclusions,” he said. Dos Pueblos High School presents West Side Story April 12 at 7 p.m. and April 13 at 2 and 7 p.m. See dptheatrecompany.org. Laguna Blanca presents Once Upon a Mattress May 2-4 at 7 p.m. See lagunablanca.org/arts/upcoming-productions. San Marcos and Santa Barbara high schools are producing newer musicals — Catch Me If You Can and Matilda, respectively. Shannon Saleh, who previously ran the Outburst youth theater program, is in her first year at San Marcos and wanted to produce a big ensemble show with “pizzazz.” “Catch Me if You Can features some very sassy numbers involving nurses and stewardesses,” said Saleh. “Although it is staged in the 1960s and uses some of the stereotypical gender roles of that time period, we are changing up some of the roles to modernize the show.” Saleh has focused the students toward learning about the changing gender-based social norms of the last 60 years in their character preparation. “I hope my students learn about the progress we have made as women in society, in terms of respect, power, and personal freedom, but also in concrete areas like job availability.” Indeed, this generation of female students knows that nurses and stewardesses aren’t the steel beams holding up the glass ceiling. San Marcos High School presents Catch Me If You Can May 2-3 and 9-11 at 7 p.m. and May 4 at 2 and 7 p.m. See smhstheaterdept.com. With an incredible moving set made from books, alphabet building blocks, and giant Scrabble tiles, the stage is a temple to the written word. Bella Holland, a senior performer, said “Matilda, to me, shows what we do best at SBHS … the shows here are actor-centered, and we are allowed — encouraged! — to create and invent.” Layman wants Matilda to connect with students and audiences alike, to remind everyone that reading is a political act. “Be brisk and bold and brilliant,” he said. “Resist. Rise up. We are rebellious children.” Live theater is dangerous magic, he said, and actors are the magicians. Santa Barbara High School presents Matilda May 3-4 and 10-11 at 7 p.m., May 9 at 10 a.m., and May 11-12 at 2 p.m. See sbhstheatre.com.